Used Car, Truck and SUVs Dealership Center Point, IA - David A. Farmer, Inc. Welcome to David A. Farmer, Inc.
We are a small family owned auto, truck and motorcycle dealership established in 1967, located at 1613 Franklin Street, Center Point, Iowa since 1986 - just 10 miles north of Cedar Rapids on US Highway 27 (Avenue of the Saints). We also have a display lot at 300 Franklin Street in Center Point with additional inventory and American Steel carport displays which we also sell. Honesty and integrity is our top priority. Here at David A. Farmer, Inc., we realize our reputation is our most valuable asset, we have built our business on repeat customers and our goal is for you to be one of them. 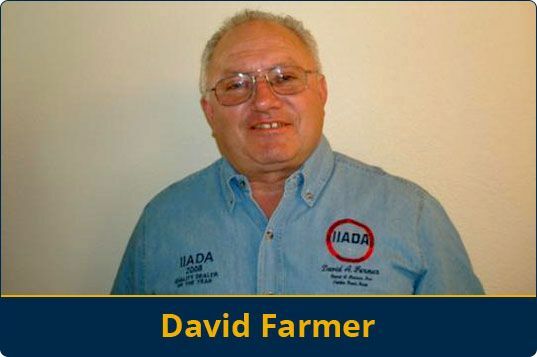 We are proud members of the National Independent Automobile Association and the Iowa Independent Automobile Dealers Association in which David Farmer was awarded the 2008 Quality Dealer of the Year Award. Please stop in or give Darren a call at 319-849-2432 or toll free 877-272-8861. We Buy Used Cars, Trucks, SUV's and Motorcycles(Call or Stop Out Today)!!!! !